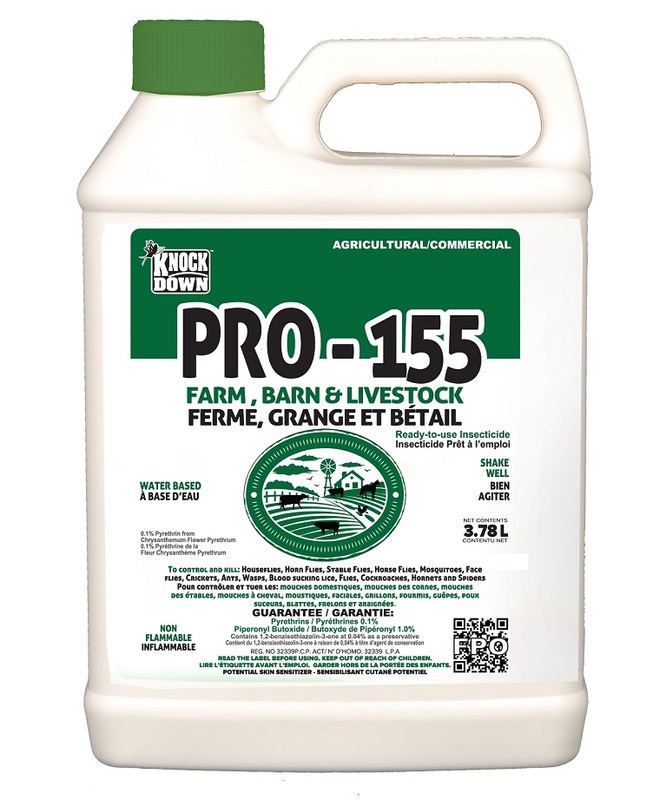 KD155CP – KNOCK DOWN™ PRO – 155™ RTU -FARM, BARN & LIVESTOCK – KUUS Inc.
FOR USE AS A SPACE SPRAY (FOGGER) IN BARNS, HORSE BARNS, DAIRY AND HOG BARNS, FEED LOTS, PIGGERIES, MILK ROOMS, BEEF BARNS, HORSE STABLES AND POULTRY HOUSES. DO NOT USE OR STORE IN OR AROUND THE HOME. FORMULATION. For maximum effectiveness, a combination of surface spot treatment and fogging is recommended. •FOR USE AS A SPACE SPRAY (FOGGER) IN BARNS, HORSE BARNS, DAIRY AND HOG BARNS, FEED LOTS, PIGGERIES, MILK ROOMS, BEEF BARNS, HORSE STABLES AND POULTRY HOUSES. To clear areas of listed flies, mosquitoes, spiders, ants and cockroaches apply using a space sprayer (fogger) adjusted to deliver a fine mist such as Fogmaster or U.L.V. equipment which dispenses a fine mist with droplets 15-25 microns in diameter. Remove all animals at the time of spraying. Eliminate all sources of ignition. Close all windows and doors, and shut off ventilating systems and sources of ignition. Direct spray upwards to fill the room with a fine mist. Use a rate of 200–300 mL per 100 cubic metres. Leave the room closed for 15 minutes before ventilating. Do not use in dwellings. Ventilate and keep animals out of of sprayed areas for 1 hour before re-entry. Sweep up dead insects. Repeat as necessary with additional spraying of breeding areas. Spray only when temperature is under 32° C. Do not use in milking parlour areas. • IT IS ALSO DESIGNED FOR USE AS A SPRAY TO PROTECT DAIRY, BEEF CATTLE, HOGS AND HORSES FROM THE ATTACK OF BITING FLIES. FOR USE AS AN ANIMAL SPRAY TO TREAT BEEF, DAIRY CATTLE AND SWINE: For mosquitoes, horn flies, horse flies, and stable flies –apply up to 30 mL per animal using a fine mist sprayer. Spray from a distance of at least 1 m. Cover the entire animal without making the hair wet. DO NOT SPRAY IN EYES OR MOUTH. Repeat as necessary, but not more than once per day. When treating dairy cattle, treat at least 20 minutes before milking and do not spray directly on udder. Wash udder before milking. TO TREAT HORSES: For horn flies, house flies, horse flies, mosquitoes, and stable flies – apply 15 mL per animal using a fine mist sprayer. Cover the entire animal without making the hair wet. TO CONTROL BLOOD SUCKING LICE ON CATTLE: Apply to the infested areas of the animal, using a stiff brush to get the spray to the base of the hair. Repeat as necessary but not more than once a day.